I really enjoy browsing online for used gear. Fortunately, I have a budget, or there would be no room left in my house for furniture. However, I come across some VERY interesting items, & hope that other Washburn fans might benefit from this. Lately, there's been some unusual Washburns appearing, & generally at a price you'd probably find pleasant. Here's this evening's run through the nation's Guitar Centers. And to stay true to my penny-pinching roots, I will not venture higher than $299.95. Here's one someone recently asked about: one humbucker, big vibrato system, $249.99. While in plain black, & with a repaired neck, I've never seen a P2 so low as $169.99. One of the oddities: the Idol from the brief HM Series, $199.99. Good basic snakehead AG-30 dread, $149.99 -- whoops, dropped to $110. Will you be updating this thread as you run across new offerings? I've heard the Folk config is better for soloing because it has a wider neck (closer to a nylon). But, heck, I also play mandolin, so tight spaces have never been much of a problem. I hope to add new "runs" in future (probably editing out the old stuff as I do). I started a similar thread under Electric Guitars, only to realize that I was also including a bunch of other gear. Makes more sense to put it here, in a more generic area. Generally, it only takes me a few minutes to sift through hundreds of guitars, flagging whatever jumps out at me as interesting. (It's a good way to wind down after a long day, or to amuse myself when I'm ill.) Scanning those listings takes longer. And then I have to copy/paste the URLs & at least hint a little as to WHY the piece got my attention. Most of the folk guitars I have played had not only wider necks than most steel string guitars, but they also did not have a radiused fretboard, like most steel string guitars have. The fretboard was flat like a classical guitar (that's important when choosing a capo). Bob Dylan played a folk guitar a lot at first.....as one would expect. Not feeling the need to shop lately, but I do note a few interesting pieces on shopgoodwill.com. 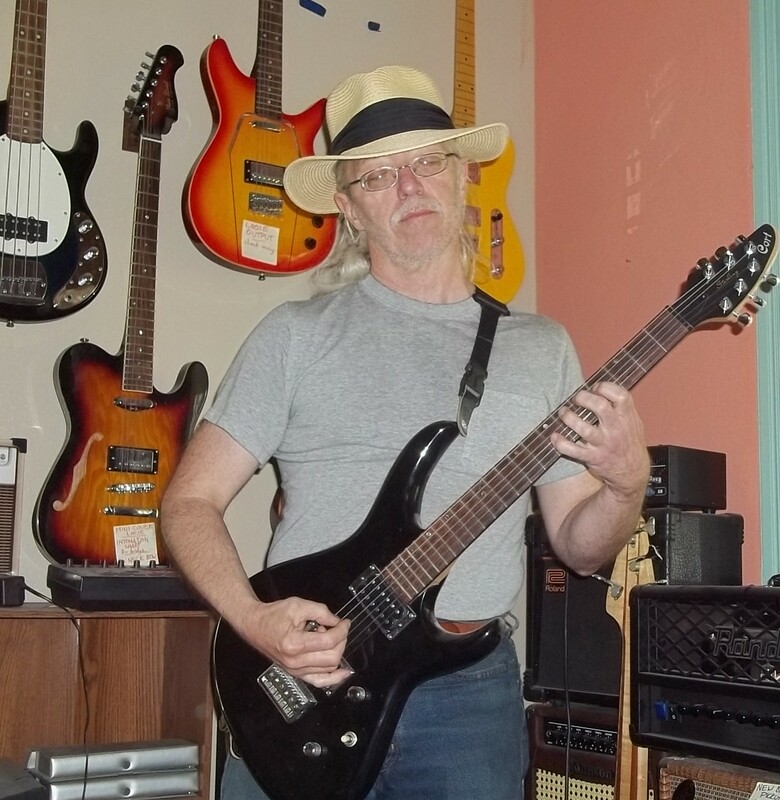 Generally, I don't direct people there because the bidders are a bit crazed & will often pay more than they could hope to get on resale, & sometimes more than an identical guitar is selling for used at GC or MGR. Then again, this is a marker for what I might stand to collect if I auction a similar item, therefore valuable intel. Many of the stores refuse to ship items. Of the majority that do, s/h charges can vary wildly. This KC-40V is interesting for its finish (all-around, too) & for the case (maybe $70 new; a no-compartment "neck breaker," but solid enough, possibly near-new as the velvet hasn't been destroyed by the bridge yet). The edge chip knocks it below 80%, so <$200 on a pre-1992 $470 axe -- not "collectible" but really not terrible as a player. At $52 with three days to go. Roughly contemporaneous, an MG-40 in red (perhaps metallic). It's SRP was $100 more than the KC-40, so worth $25-$50 more now, better condition but no case, so if you're already in the market, maybe $250 max. Two days to go, hasn't hit $40. Hah!! You all thought I was hallucinating when I asked about the Rover dulcimer!! Here's a rare RO-5, almost entirely a lawsuit-able ripoff of the McNally StrumStick (for instance, note the three inset strips of hard plastic to keep the strings from sawing into the peghead). Well, at $70, it's cheaper than a used McNally, & the available cases are better. I don't have my notes handy, but this looks like a BT-10 or thereabouts, which I didn't know existed in the "BillyT" line before it was renamed "Maverick." In any case, $200 is not a bad price. If you can afford $650, then find someone who loves you & make them hold your cash & credit cards before you check out this J-10. The headstock inlay alone is hypnotic. Despite my advice, some people want to believe the "special edition" hype, so here's a $400 DM2000SCE with nice inlays & a case. Nice guitar, but hardly "collectible" much less "rare." ...but $300 can get you a D-25. ...while $250 buys an all-wood WD32. Likely as overpriced ($600) as it is gaudy, this flag-bedecked Vee is perfect for anyone feeling insecure about their loyalty. Still, nicely made (of course), well-loved, & has a case. As awkward-looking as ever, $150 for a PS-400 is not a terrible deal. Tonight's "I reallyREALLY wish I could buy this" is a $300 R-60BCE thin-body electrified resonator. This just DEMANDS jangly fingerpick blues. If you'll post the entire serial number we may be able to provide an approximate date of manufacture. If you want more info, we'd need a model number and photos really help. We use to use Photobucket before they got greedy, so check out the thread in the General Discussion board regarding posting photos. P-II, in CSB, $280 + $55. BT-8in CSB, $300 + $55. G4-V, $140 + $150 + $40. MG-43 -- rare for being s-s-s AND maple fretboard -- $220 + $55. Some scraps to clear the browser.. Neck from an SBT-21, $30 + $20. Even if this WERE an "X Series" (almost always code for "X-10 but we're terrible at research" ) it'd be a bargain at $80. At least they call this one a "Billyt" (almost got the typography right!! ), if you've done your homework you'll know a BT with Rose is AT LEAST a v.1 BT-6; factor in h-h & bound top, & it'd be a BT-10, MSRP $899.90, one of the priciest to come from Korea, yours for $200. Looks like a Washie fan has left the fold. The Natick store has an interesting pair: a Dan Donegan DD-61 ($200) AND a matching WI-63 ($200). They also have a DD-60, $160. Though above my usual pricerange, at $540 this N-61 is something seen much less than the usual "Nuno" models, so I'd consider it a bargain for those so inclined. A rather lovely (& obviously loved) J-9, with HSC, just $400. You don't see many of these: an RR-150 solid-body electric-acoustic (separate piezo output), $380. Nice chunky J-3, down to $338. Maybe a little steep, but a well-kept G-10V (w/Wonderbar) in HSC, $330. The next they call an "X-50 Pro." I think they're idiots. Though there certainly were a dozen (at least!) pricier variants on the X-50, I'm moderately certain none of them had either a rosewood fretboard or HeadHunter pickups. Still, $200 buys a good straight-up guitar. Looks like the KC-70V is at a $200 plateau. The X series was vastly underrated; I bought an X-10 for cheap & was overall quite pleased. Was it an X-11 that had the "flaming skull" graphic? In any case, a reasonable example for just $110. If you'd like to try seven strings, this X-27 is pretty painless at $100. A black "Pop Top" vee, $150. Difficult to argue the simplicity of the G-1V, especially for $100. This MG-43 is one of the few Washburn s-s-s models, basically a 24-fret Strat with Rose, $200. In 40 years, Washburn has almost entirely avoided doing straight-out Fender clones, exceptions being rare Silverados, & the unjustly ignored Lyon Series & Shadow Series. The Shadows have been trickling in (note stock Grovers), here an hss WS-6 ($120) & an absolute bargain ivory ( ) sss WS-4 ($90). If you want a player for cheap, skip the Squires entirely. Oh, dear, speak of the devil. The Lyon Series has been damned by name association with "Lyon by Washburn." Well, general ignorance gets a bargain: here's a black hss with skunk-stripe neck & maple fretboard (no Grovers, alas! ), $80. Speaking of Grovers, they do appear on this basic (albeit purple) MIK Mercury, $75. The one that tempts me tonight is a TB-100, from the VERY short-lived "Tabu" series, only $70 for HeadHunters AND black Grovers. To the handful of people (as opposed to adbots & scammers ) who still read this site, my apologies for not keeping up with this thread. I'll eventually clear out the dead links. A WI64M3, $200. An unusual variant, nice red "crackle" finish. If you'd like to add a great Tele clone to your arsenal, the WI-36 is unique: basically a Gibson-scale Tele with a mahogany body. On this one, the butterscotch blonde finish is quite nice, as is the $150 tag. A nice red hss Shadow Series WS-6 (with, naturally, Grover Rotomatics), a mere $70. As I've often said, "the market" is populated with fools. There are all sorts of Mavericks littering the landscape, prices continue to slide, yet people will pay more for a beat-up Fender Affinity than for a sweet Maverick. Don't see many of these, especially at this price: a BT-3 in cherry sunburst, $80 (+$60 s/h). Sometimes the "clown paint" CSB looks pretty good. If you don't mind black, you can get a BT-3 for twenty bucks less. Well, save me from myself -- here's another, $130 + $55. A few others catch my eye. While it's $281, that's not bad for Washburn's short-lived RS-10V, a PRS clone but with Rose bridge. Even the series prefix is begging for a lawsuit, but it gives you the Standard 24 config AND the discontinued classic short neck heel AND higher build quality (& significantly lower price) than the SEs AND a vibrato too. Finally, the one I hate walking away from: D-46SCE. I am proud to own a D-46CESPK, but I've always wondered how much better the spruce-top version would be. Making it tough is the recent price drop to... $180. I'm looking for an electric guitar not more than $150, any suggestions?